Why Build a Studio Cyc Wall? Commercial advertising photographers use a cyc wall for professional lighting and no horizon line. This article is about how to build a commercial photography studio cyclorama. Imagine being inside an empty egg. There you are, surrounded by white, with no horizon in sight. Your depth perception is gone, but it’s not stressing you out, because you are calm, Zen like, suspended in the illusion of endless space that is silky white and smooth. This is what a car sees inside a cyclorama, also known as a infinite-wall. I’ve built several cyc walls to photograph cars and products. When I built studios in Long Beach and Brussels, I made purpose built cyc wall lighting systems for car photography. Izmostudio’s require very high volumes of commercial photography, interactive media, and custom commercial advertising photography. Many other parts of the media industry use cyc walls for all kinds of photography and video production like fashion, large product sets (think furniture), movies, green screen special effects, and television sets. Common to all are the smooth walls sans horizon, and the creative capacity to play with light, and shadow, on smooth curvy white cyc walls. As common as cycloramas are, there are many times I see a blank look of confusion, when discussing cyc walls with different people. Maybe I’ve mistaken the calm, suspended, Zen look, for a blank stare of confusion. In case it is confusion, I thought it would be cool to write a quick review of the three basic forms of constructing a studio cyc wall. Building a cyclorama is basically building walls, with smooth curves instead of right angles. The difficult part is the corners, where two or more curves meet. The three different structural materials I’ve used successfully are wood, steel, and fiberglass. Each one has advantages, which I will review. All three different approaches, require some form of sheetrock or drywall and plaster. For our European friends, this material is known as Gypsum plaster. Building a cyc wall is like any construction project. The space you have available and the budget for time, materials and labor drive the process. Make sure that these elements will meet your production goals. Producing commercial video or advertising photography of large shinny objects requires much more cyclorama than beautiful models with wind blowing through their hair, or a small green screen set for composite and EFX work. Now that you know the size of the cyclorama that you need to cover the subject, and provide enough background from your field of view (FOV). Let’s look at the all-important radius. 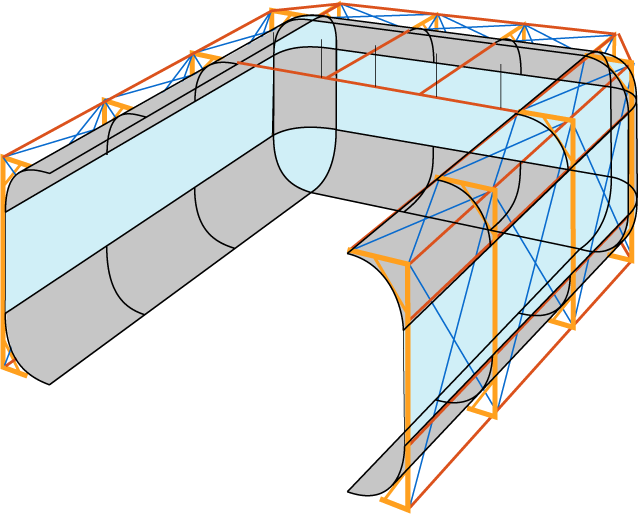 The goal is to hide the right angle intersections from wall to floor, wall to wall, and possibly wall to ceiling, with a top radius. All radius joints need to be as smooth as possible, with no visible seams, just like the inside of our egg. How much radius will you need? The size of the subject will determine some of this decision. The radius key is – the larger the curve of the radius – the greater the achievable distance from the subject, and the more cyclorama background you can have in the FOV without seeing the radius. Larger = smoother transition. If someone says you can light a radius enough to hide it. Forget about it. Unless you plan to shoot on 100% white all the time ignore this distracting idea, and take the time to build it right, so you can focus on lighting the subject, and not fight with the background, or add extra post-production costs. Naturally this seems like the easiest solution – Pre-fabricated fiberglass pieces. 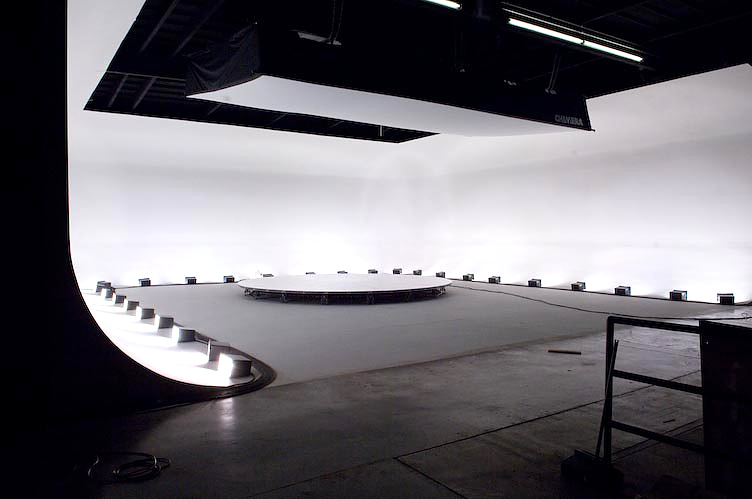 You can buy radius pieces, corners, or as a complete cyclorama system. With the radius delivered to your door, it is relatively easy to install, and all you have to build is the structural (studs) and flat wall parts. The real joy of the pre-fab fiberglass solution is the corners, which I spoke about earlier as being – not so fun to build. Some providers of pre-fab cycloramas offer a modular freestanding system – “cyc on wheels”. Ready made and modular sounds really cool for some applications. Taking fiberglass one step further is a custom built solution, where a model maker can make the mold for you and then just push out the radius pieces. The biggest advantage of pre-fab cyclorama systems, and fiberglass radius pieces, is that they can be used, disassembled, and re-installed, when your studio business moves. It’s worth considering the lease terms on your studio space, when making this decision. In the USA Pro-Cyc is the leader and offers several pre-fab, modular, and permanent cyclorama systems. Wood and plaster are excellent materials for building more permanent cyclorama installations because these materials are more flexible to form, and a bit less forgiving to errors. In my case I always worked with a good contractor or carpenter to make the parts. Working with a contractor is a good way to approach this option because there are four professions required, framing, carpentry, drywall, and painting. 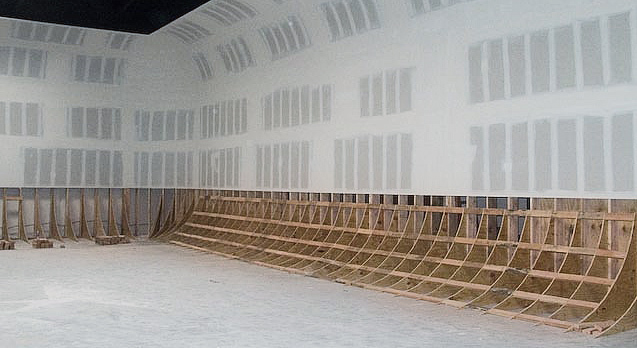 Framing the walls of your new cyclorama is basic wall construction. Make the frame to code for your local area! Make the radius from 4X8 sheets of plywood. Use a table saw to cutout the radius. Place one radius at each frame stud. It is possible to get two 5ft. (1.5m) radius from one 4×8 sheet of plywood. Make support blocks from 2×4” s. For the bottom radius, I would make one support block for every foot of radius distance. If you plan a top radius you could use fewer support blocks, since it’s unlikely anyone will walk or skateboard up the top. Place two sheets of ¼” plywood on the bottom radius to cover. You might be able to use just one sheet depending on the amount of traffic and support needed. If making a top radius the plywood is not needed for support, and it adds too much overhang weight. For the corners use wood slats and chicken wire. These two materials will provide a good base to add plaster. Plaster and sand to make the corner shape. Start the corners at this at this step, or in parallel with drywall, since the amount of plaster required will have long dry times. Now drywall, tape, and mud the entire cyclorama. Place the drywall horizontally on the radius. Although it seems a bit counter intuitive, the horizontal orientation will bend enough. A light misting of water will help bend just enough to get it in place. The reason for the horizontal bend is that it is less tension, and therefore less likely to crack over time with temperature and humidity changes. The last step is to finish the surface by sanding, a coat of primer, and painting. Generally, cycloramas are painted white. I would suggest not using a pure super white paint, for light exposure value reasons. And if your budget and sport the cost go with Silicate Dispersion Paints. The benefits of steel are its structural load capacity and lower labor cost compared to wood. Depending on where you are located the material choice can vary widely between steel and wood. Not to mention responsibly harvested sustainable wood. Commonly steel is a higher material cost, with a lower labor cost. Steel studs come pre-cut from the vendor, and are much faster to work with. The process for the walls is the same with steel. The difference is in the radius. The actual curved supports for the radius are still made from wood. Although for this steel structural method, use ½ inch pressed particleboard, or chipboard in Europe. Instead of layering plywood for the surface of the radius use steel studs placed horizontally the length of the wall. For a five foot radius, I used four horizontal steel studs evenly placed, from the top down through the arch of the radius. This method is super fast. Just screw the studs into braces on wood radius pieces. The horizontal steel studs also provide the support for the drywall surface. Place the drywall horizontally at the top first, and down toward the bottom to the radius where it meets the floor. An excellent Portuguese gypsum professional pointed out the that two thinner pieces of drywall are better than one thick piece, for resistance to cracking due to temperature changes. Who would argue with Portuguese gypsum professionals? Not me, so I took this advice and used two layers of ¼ inch drywall, for the radius surface, instead of one 1/2” inch sheet. If you are installing a top radius one horizontal steel stud, with layer of drywall, is enough for the top return, without adding too much weight. A five foot overhang needs to be supported securely from the top and sides, so adding any extra weight to the top radius just means added expense for its structural support. The last step is to finish the surface by sanding, and making sure the transition joints are super smooth. I recommend good lighting for this finishing phase. Add a coat of primer, and then paint. I would suggest not using a pure super white paint, for light exposure value reasons. These are three basic options for cyclorama construction. Albeit a little on the large scale for cars, but the methods will pan out at any size. Do you have some experience to share? Send us comments and pictures of your new cyclorama or one that you are building. Note: This is a re-post from 2011, when I directed the automotive studio and car stock photography business units for izmo.